Elation Stage Color LED DJParts - All Variety of Parts that DJ Needs. Inspired from the highly successful STAGE COLOR, the Elation Professional, STAGE COLOR LED incorporates the latest in LED technology to fuse the ultimate professional stage lighting Par Can. The STAGE COLOR LED combines DMX-512 protocol along with RGB color mixing to create precise control of a large palette of colors from one fixture. 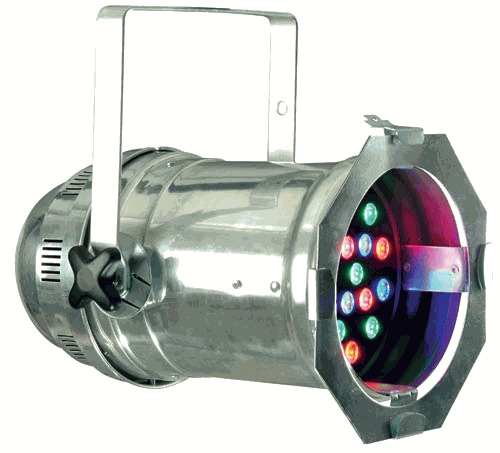 It’s 24 bright 1-Watt LEDs produces a high impact without the heat emissions of a traditional par can; thus entertainers will stay cooler on stage. With 50,000 hour rated reliable LED technology, the STAGE COLOR LED will need virtually no servicing and produces the highest quality of output without color fading. DIMENSIONS & WEIGHT: • PAR 64 CAN size • (LxWxH): 18.5” x 10.75” x 10” / 470x274x254 mm • 9 lbs. / 4 kgs.